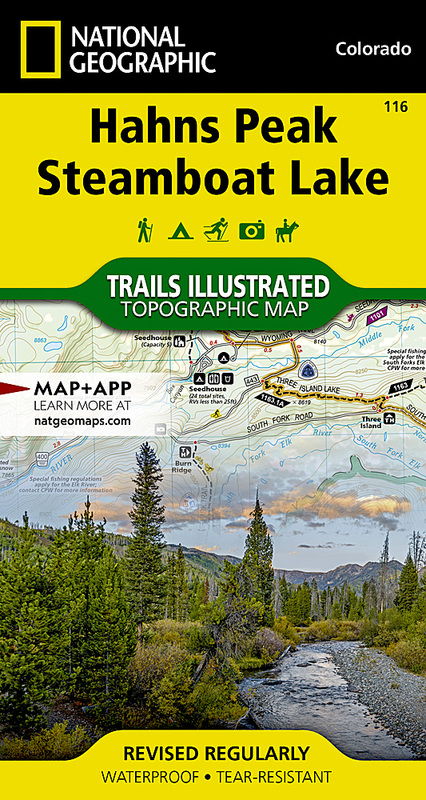 Expertly researched and created in partnership with local land management agencies, National Geographic's Trails Illustrated map of Hahns Peak and Steamboat Lake provides an unparalleled tool for exploring this magnificent region of northern Colorado. Located in Routt National Forest, this picturesque peak and the lakes and mountains surrounding it on the Continental Divide offer activities for outdoor enthusiasts of all levels. Some of the key areas of interest included are Hahns Peak Lake; Steamboat Lake and Pearl Lake state parks; Bear Creek Lakes; Routt National Forest; and Mount Zirkel Wilderness. This map can guide you off the beaten path and back again with miles of mapped trails including a portion of the popular Continental Divide Trail. Hiking trails, mountain bike routes, and motorcycle and ATV trails are clearly marked. Road types are differentiated as well, so you know if the route you choose is a paved, dirt, four-wheel-drive, or high-clearance road. Whether RV camping or "roughing it" campers will appreciate the inclusion of RV dump stations, campgrounds, yurts, and picnic areas. Year-round activities abound in the region and the location of fishing areas, cross-country ski areas, interpretive trails, boat launches, wildlife viewing sites and more make this map as highly functional as it is remarkably crafted. The map base includes contour lines and elevations for summits, passes and many lakes. Other features found on this map include: Mount Zirkel, Mount Zirkel Wilderness, Routt National Forest, Steamboat Lake.